A villager in West Borneo says he heard crying in the rainforest. 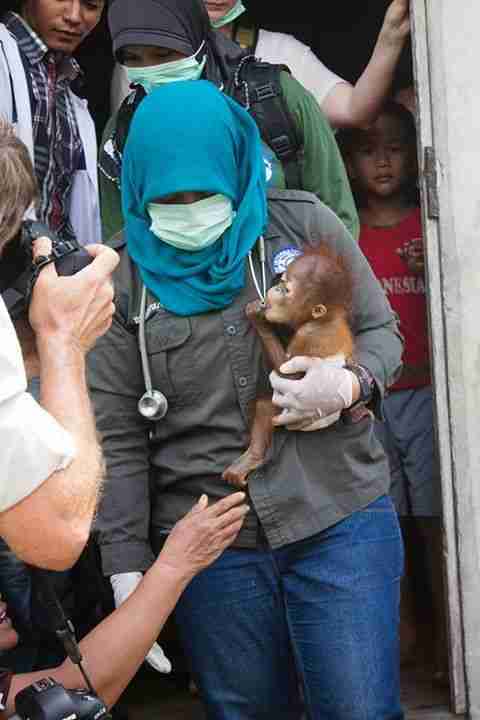 He followed the sounds, and claims he found a tiny orangutan, all alone, no mother in sight, according to International Animal Rescue (IAR). The man took the little orangutan into his home, where he tried to care for him for four weeks by feeding him condensed milk. But the man realized the baby, Asoka, needed more professional care to survive, and he contacted the local forestry department for help. We never know the full story of why the baby orangutan was left alone - we may never know for sure whether the villager's story is even true. 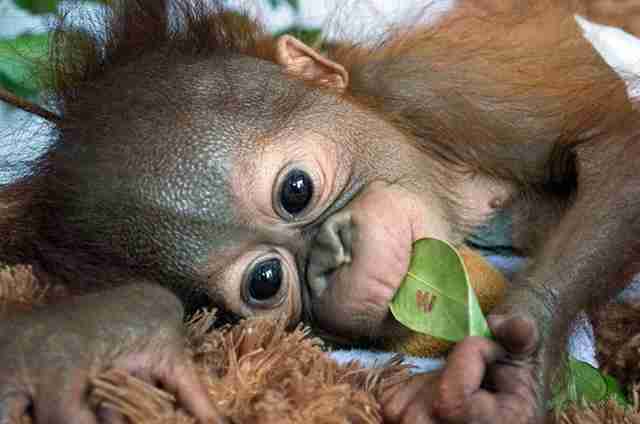 But we do know that rapid deforestation for palm oil means more and more orangutans are under serious threat, and many displaced orphans are sold into the cruel pet trade. Asoka is now in the care of the IAR, which hopes to raise him into an orangutan healthy enough for release into the wild. 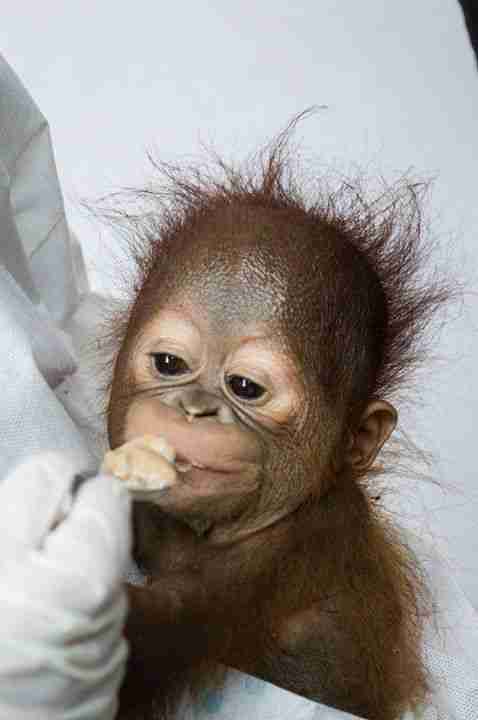 "He is as cute and contented as can be," Alan Knight, CEO of IAR, said in a release, "but his story is typical of the tragic fate threatening the survival of orangutan populations in Borneo and Sumatra." 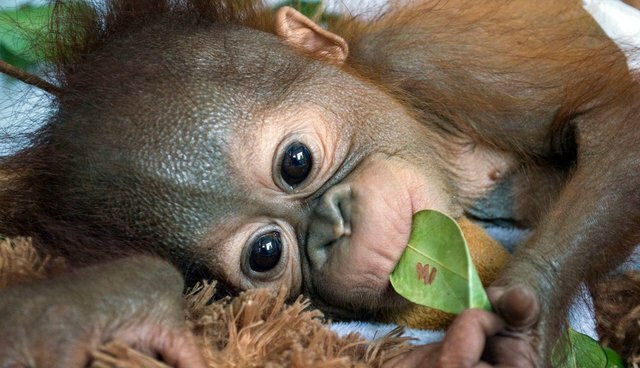 As people encroach on wild habitats in Indonesia and the palm oil industry devours the rainforest orangutans and other magnificent creatures call home, more and more animals are left homeless, hungry and vulnerable to hunters, Knight said. "The adults are killed while the babies are torn from their dying mothers and taken to be sold as pets." "It breaks my heart to think that for every little orphan that has been saved, a mother surely has died by the hands of humans who cut down the forests where they once lived," a commenter wrote on Facebook.